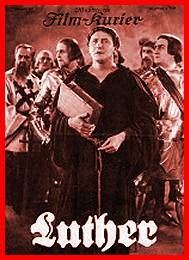 Scheda: Nazione: Germania - Produzione: Cob Film - Distribuzione: Reformation Films - Formato: B.N., muto. Cast: Eugen Klöpfer, Wilhelm Bendow, Karl Elzer, Bruno Kastner, Rudolf Lettinger, Theodor Loos, Hans Carl Mueller, Mary Parker, Max Schreck, Jakob Tiedtke, Hermann Valentin, Elsa Wagner. Conosciuto anche con i titoli: Martin Luther; Ein Film der deutschen Revolution von Hans Kyser; Der Mönch von Wittenberg. Scheda: Nazione: Australia - Produzione: Australian Broadcasting Corporation (ABC) - Distribuzione: Australian Broadcasting Corporation - Soggetto: dal dramma di John Osborne - Sceneggiatura: Philip Grenville-Mann - Formato: B.N., film tv - Durata: 90'. Cast: Terry Norris, Douglas Kelly, Brian James, Syd Conabere, George Whaley, James Lynch, William Lloyd, Michael Duffield, Beverley Dunn, Michael Cole. Scheda: Nazione: GB - Produzione: BBC (British Broadcasting Corporation) - Distribuzione: BBC - Soggetto: dal dramma di John Osborne - Formato: film tv. Cast: Geoffrey Bayldon, Alec McCowen.